Who the Hell is Nagini, the Snake Woman in "Fantastic Beasts: The Crimes of Grindelwald"? Who the Hell Is Nagini, the Snake Woman in ‘Fantastic Beasts: The Crimes of Grindelwald’? 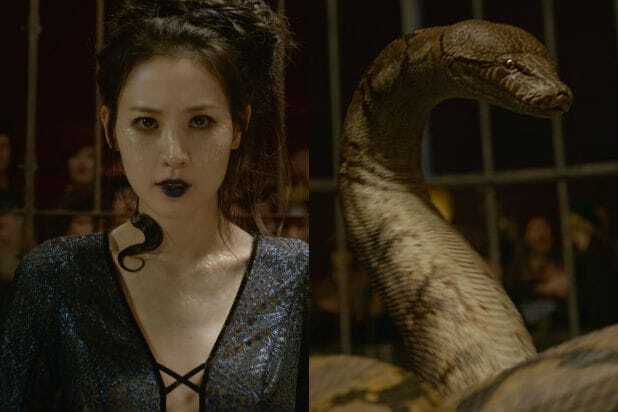 In “Fantastic Beasts: The Crimes of Grindelwald” Claudia Kim’s previously unrevealed character is a witch named Nagini, who has the ability to turn into a snake. So why is this a big deal? Because Nagini also happens to be the name of another iconic “Harry Potter” character — Lord Voldemort’s magical, extremely murderous pet snake. Well, just in case there was any doubt, “Harry Potter” creator JK Rowling confirmed the two characters are one and the same. Let’s back up a bit. In “The Crimes of Grindelwald,” set in 1927, Nagini is part of a traveling magical freak show, where she entertains the crowd by turning into a snake. As it happens, she is a human witch who suffers from a blood curse called Maledictus. This particular curse has never before been mentioned in “Harry Potter” lore, but according to Rowling, the victim will eventually transform permanently into an animal. And, as you can see below in the trailer, before the animal form becomes permanent, the victim apparently has the ability to transform at will. But of course we know now we’ve seen Nagini before. She first appeared in “Harry Potter and the Goblet of Fire,” the fourth “Harry Potter” novel, set in 1994-1995. Presented there as an unusually intuitive serpent, Nagini serves Voldemort, who is in bad shape after being defeated by an 11-year old Harry at the end of the first book, “Harry Potter and the Sorcerer’s Stone.” He’s now in hiding, forced to live in what amounts to a gross, reptilian infant body, and Nagini’s venom provided the magic that created that body. But Nagini served a far more important purpose for Voldemort as well — one of his horcruxes. In “Harry Potter,’ a horcrux is an object in which a wizard or witch hides a piece of his or her soul, by performing a spell sometime before or immediately after committing the “supreme act of evil,” deliberate cold-blooded murder. The upshot is that as long as the horcrux isn’t destroyed, that piece of soul remains in the living world regardless of what happens to the wizard or witch’s actual body, granting a kind of immortality. The downshot is that the whole thing pretty much ruins what’s left of the wizard’s soul overall. 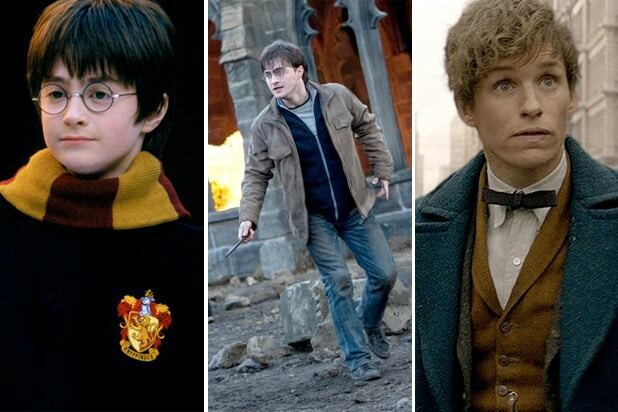 Voldemort’s goal is to create seven horcruxes, and by the events of the “Harry Potter” novels, he has six of them. But he paid a heavy price. Remember that reptilian baby body? His original body was destroyed when he tried to murder Harry Potter as an infant 14 years earlier, reducing him to a ghastly form which we’re told was a miserable, painful existence. Nagini’s venom helped him upgrade, slightly, and once he’s fully restored, she is about the only thing Voldemort, who is only barely human at this point, seems to have affection for. See? They’re really tight. The way Nagini first came to be Voldemort’s serpentine companion is unknown so far, as is the reason they’re so close. What we know for sure is that Voldemort turned Nagini into a horcrux just prior to the beginning of “Goblet,” that it’s strongly implied she’s already accompanied him for some time, and that he encountered her while he was hiding out in his wretched ghostly form in the forests of Albania. Of course, fans know Voldemort had twice hidden there — first, for around ten years after his failed attempt to kill infant Harry, and then for about two years until committing the murder that turned Nagini into a horcrux. So your guess is as good as ours. See more here. The thing is, in the books, Nagini was never depicted as being a former human. Instead, her unusual connection to Voldemort is largely explained away by the fact that Voldemort is able to speak and understand the language of snakes. But lest you think she just pulled this out of her hat recently, JK Rowling insisted on Twitter Tuesday that she’s been sitting on this secret since she first started writing the Harry Potter series. It remains to be seen if the “Fantastic Beasts” films will eventually explain how Nagini went from whatever she was doing in 1927 to serving as Voldemort’s henchsnake in 1994. But at least we know where she’ll end up: dead, the last horcrux to be destroyed, which allows Harry Potter to ultimately defeat Voldemort. That’s what you get for hurting Snape, jerk.